The presidential candidate raised $6.1 billion in 24 hours after announcing. Co-hosts on "The View" weighed in on Democratic presidential candidate Beto O'Rourke after he backpedaled some remarks he made over the first weekend of his campaign run. 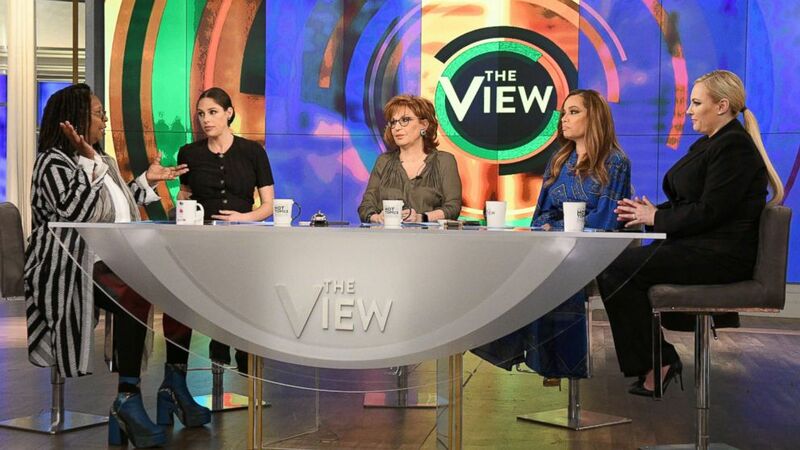 On Monday morning, Whoopi Goldberg, Abby Huntsman, Joy Behar, Sunny Hostin and Meghan McCain acknowledged O'Rourke's accomplishment of raising $6.1 million -- the most donations given to any 2020 candidate in the first 24 hours of a campaign up to this point -- but they questioned if the media should be more focused on his policies. O'Rourke was featured on the cover of Vanity Fair along with a quote he said about the presidential race: "I want to be in it. Man, I'm just born to be in it." His controversial Vanity Fair comment -- which he struggled to recall on Sunday, saying he doesn't "know that anyone is born for an office or a position" -- received mixed reviews from the public, including conservative co-host McCain. Noting she doesn't often throw around the term "white male privilege," she said she believed that's what O'Rourke's "born to" be the president comment conveyed. "If Hillary or Kamala or anyone had been on the cover of Vanity Fair saying 'I was born to do this,' the media would be going insane right now," she said. McCain continued to give presidential candidate Kamala Harris praise, saying her campaign "roll out was more seamless in a lot of different ways" than O'Rourke's, yet "she's not being given the same credit he is," exposing the gender "stigma in politics." "It does seem like the media is giving [O'Rourke] more credit than he deserves." O'Rourke also said this weekend he would like to put a woman vice presidential candidate on his ticket after a supporter voiced the need "to drive this country forward and put a woman on his ticket." O'Rourke told the supporter "your point is taken" during the exchange while mentioning several times "it would be very presumptuous for me to talk about who I would select as vice present right now." Goldberg -- who joined "The View" for the first time in over a month after battling a near-death case of pneumonia -- didn't skip a beat responding to O'Rourke's "preference," questioning what made him think a woman wants to be his vice president. (Lorenzo Bevilaqua/ABC) Whoopi Goldberg, Abby Huntsman, Joy Behar, Sunny Hostin and Meghan McCain host ABC's, "The View," on March 18, 2019. "Why would you think she needed you to do that?" she continued. "You have to be careful with privilege like that because things slip out your mouth." "You can't assume that because you're good at fundraising you're going to be the person," she added. Huntsman admitted she's "not the biggest fan" of O'Rourke at the moment, but believes "there are Democrats that think he has the sort of rockstar status similar to what Obama [had]." "I think a lot of politics is about how they make you feel," she commented. "Do you vote for the person you like most, do you vote for the person you think can get through the primary, or do you vote for the person you don't love, but know that they are the one person who can probably beat Donald Trump in general election?" "Maybe he could go up against Trump in a way different than other candidates," she added. Hostin noted that it's "kind of interesting" that O'Rourke "seems to have this mass appeal" across all 50 states. Prior to O'Rourke's surprising $6.1 million raised in one day, fellow presidential candidate Sen. Bernie Sanders held the 2020 fundraising record with $5.9 million. In addition to Sanders and O'Rourke, there are 13 other candidates in the overcrowded Democratic Party, not including potential candidate and former Vice President Joe Biden.